First, Nvidia's announcement: the Quadro K5000. 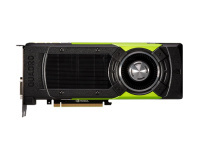 Based on the latest Kepler GPU, the Quadro K5000 includes 1,536 CUDA cores and 4GB of GDDR5 on a 256-bit memory bus. The result, Nvidia claims, is a card capable of pushing 2,150 gigaflops in single-precision mode or 90 gigaflops in double-precision mode. Coupled with support for DVI-I, DVI-D and DisplayPort monitors - with the option to drive up to four independent displays from a single board - the company is clearly hoping to win over pro-graphics types with the two-slot 122W TDP design. As befits a Kepler board, the Quadro K5000 also includes bindless texture support for referencing over a million in-memory textures with reduced CPU overhead and TXAA anti-aliasing - both features missing from prior Quadro products. 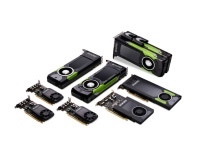 If you were thinking about adding a Quadro board to your next build, however, the price may be something of a stumbling block: while UK pricing has yet to be confirmed, Nvidia has given the Quadro K5000 a US recommended retail price of $2,249 (around £1,440 excluding taxes) ahead of its planned release in October. For those who prefer pre-builds, Nvidia has announced that Maximums systems - combining a Tesla K20 processor with the Quadro K5000 - will be available from the likes of Dell, Fujitsu, HP, Lenovo and Supermicro by the end of the year. 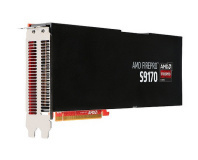 AMD's offerings start with a quartet of FirePro boards based on the Graphics Core Next (GCN) architecture. The entry point for the new boards is the FirePro W500, a Pitcairn-based system which packs 2GB of GDDR5 on a 256-bit memory bus with a claimed performance of 1,270 gigaflops single-precision or 80 gigaflops double-precision. A single-slit design, the board includes two DisplayPort outputs and a single dual-link DVI port, and boasts a fairly sedate TDP of just 75W. For those who demand more, the FirePro W7000 doubles the memory to 4GB of GDDR5, boosts performance to 2,430 gigaflops single-precision and 150 gigaflops double-precision, includes four DisplayPort outputs and has a 150W TDP in - again - a single-slot design. Moving from the Pitcairn boards to the Tahiti boards, things get bulkier: the FirePro W8000 has a 189W TDP and a hefty dual-slot design, but manages 3,230 gigaflops single-precision and 810 gigaflops double-precision. If that's not enough, the top-end FirePro W9000 includes 6GB of GDDR5 memory on a 384-bit memory bus, packs six mini-DisplayPorts and boasts 3,990 gigaflops single-precision and 1,000 gigaflops double-precision performance - but has a massive 274W TDP. Pricing for AMD's standalone FirePro range starts fairly low, but rapidly ramps up: US RRPs for the range have been given as $599 for the FirePro W5000, $899 for the FirePro W7000, $1,599 for the FirePro W8000 and a whopping $3,999 for the FirePro W9000. Alongside the standalone FirePro boards came AMD's announcement of two FirePro APU chips. The first, the AMD FirePro A300, boasts a 3.4GHz base clock speed peaking at 4GHz in single-core turbo mode and a 65W TDP, while the AMD FirePro A320 speeds things up with a 3.8GHz base clock and 4.2GHz peak turbo clock in a 100W TDP. Both models include 384 stream processors, running at 760MHz on the A300 and 800MHz on the A320. AMD is hoping that its FirePro-certified APUs will help end the stigma of on-board graphics for professional purposes, promising full compatibility with even high-end software packages. Better still, the company claims that a FirePro A300 will outperform Nvidia's Quadro 600 entry-level dedicated graphics board. What AMD isn't currently sharing is the price, stating only that off-the-shelf systems based on the two new FirePro APUs will be appearing some time later this month.